Maybe the dog can also take a walk through tumble-dry…. ot a day goes by that I don’t notice an example of an American trend I wasn’t aware of during the 30 years I lived in Italy. This week it’s the “gourmet” kitchen and “dream” laundry rooms. The web is packed with decorating sites and blogs. Also on my mind is how a comment of mine about these kitchens and laundry rooms gave me my first real taste of internet ire. What makes a kitchen “gourmet” (aside from twisting the French language) are “luxury” appliances (an oxymoron if there ever was one) and expensive finishes. These include an oven range with at least six, flame-throwing burners, along with two ovens, or at least an oven and warming drawer, and a microwave. There is usually an “appliance garage” for the mixer, espresso machine, etc. One refrigerator, even huge, is not enough. The gourmet kitchen has a refrigerator for wine and one for soft drinks at the “beverage station.” Sinks come in multiples too: regular, prep and bar. Welcome, dear consumer, to dream laundry rooms that offer dog-washing stations and laundry-folding tables. Humble things like backsplashes, range hoods and counters that were once only about having somewhere to work and keeping the kitchen wall from getting grody with grease now involve tiles imported from Morocco, marble slabs fit for the Taj Mahal or rare woods and honed steel. 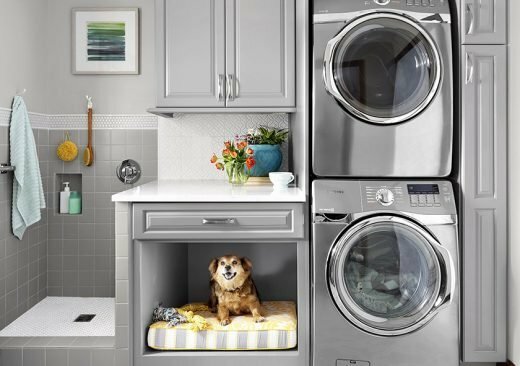 Dream laundry rooms offer dog-washing stations and laundry-folding tables. Their girth, portholes and control mechanisms make American washing machines look like they should be launched from a dry dock and christened with a bottle of champagne. Since I left the U.S. in the 1980s, the heart of the American home became a cross between Versailles and a military barracks—pancakes and laundry for a thousand in the Hall of Mirrors. For me, the comparison with Italy was inevitable. The kitchens of every Italian I know would fit in a high-end American Sub-Zero refrigerator or could be sucked up by your average American range hood. Their only sink is just big enough to wash the pasta pot. The refrigerator for everything is smaller than many wine refrigerators. And wine storage is a dark, cobwebby basement in an apartment building. The definition of Italian laundry room is the kitchen. Or, if the washer is not next to the fridge, it is either out on a freezing cold balcony or in the bathroom. The “dryer” is still a contraption of strings and pulleys over the bathtub or a rack that makes a seasonal migration from the balcony in summer to the radiator in winter. Still on four burners—none with the BTUs of jet-engines—and that scary trip to the basement, millions of Italian mamme and nonne daily produce meals as good as any Martha Stewart feast. Somehow, despite the puny washing machine and dog-washing station, Italians also manage to dress better than Americans. There are numerous explanations for the Italian ability to do so much more with so little. As a small, densely populated country, Italy has always had many limits. Today, most Italians live in apartments, and the average one is about 1,200 square feet. Italian salaries tend to be lower than American ones, too. Welcome to my new and not-so-humble kitchen. Only two generations ago Italy was a poor, rural country. Italians never had much food, and they became good cooks because they had to be clever about making it last. Their turbulent history has made Italians cautious. The national savings rate is high and there is little consumer debt. 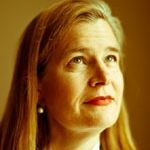 Italians are not impulsive, despite their reputation for passion. The Italian word for whim—capriccio—has negative connotations. Centuries of poverty and invasion encouraged making do and careful decision-making. When spending on big ticket items, whether new kitchen cabinets or trousers, Italians look at long-term appeal. They are averse to anything they might “tire” of. Italians do love and follow trends, which they use like spices to jazz up more traditional ingredients. Italians’ well-trained eyes also hone in on essential qualities of trendy items that will last, such as good lines or beautiful colors. As a result Italians’ kitchens and closet contents age well and gradually. Italians do not do “dream” kitchens or laundry rooms. They do possible ones. This of course is deeply antithetical to Americans. “Get it now!” and “Why wait?” are national mantras. Dreaming big is a right in the U.S. We view European-style pragmatism as weakness. We are used to limitless space and consumer credit. Making do means you are not making it. Italy’s better food and clothing illustrates what happens when you turn historical and geographical limits into virtues. So what do America’s ostentatious kitchens and laundry rooms illustrate? Perhaps that we have made our lack of limits into a vice.